It’s an eternal struggle that gets played out at dinner tables everywhere. On the plate, along with some macaroni and cheese and a couple pieces of fried chicken, sit five lonely broccoli florets, steamed to a bright green and lightly seasoned with salt, pepper, and maybe a little lemon juice. The chicken pieces and the mac and cheese will clear away, no doubt, but those florets will remain untouched. Above them, a parent bargains, pleads, and ultimately threatens to withhold dessert (or a night of video games) unless they get eaten. Yes, it’s the struggle of getting kids to eat their veggies. No matter how appetizing they are to adults, kids must be genetically averse to some of the best food ever known, which fill their bodies with all kinds of nutritious stuff they need to grow strong. 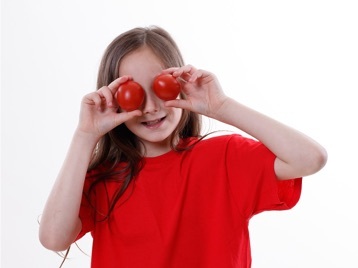 So why do kids dislike veggies? According to Juliette Steen of The Huffington Post, it largely has more to do with the bitterness in some vegetables such as broccoli and Brussels sprouts, two of the most nutritious vegetables on the planet! But our taste buds are actually conditioned to react negatively because we have a built-in aversion to bitter and sour tastes. Consider, too, that many veggies are cooked in ways that make them unappealing to kids. Kids definitely love fruit, especially apples, along with some vegetables such as corn and carrots, mainly because of their sweetness. But if we’re to get our children interested in eating other vegetables that have a taste that might be too bitter for them, we need to present them differently — and not just on the plate. Here are just a few ways to try. Kids should be educated where vegetables actually come from. A visit to a farmers market connects them with real food. Ask them to find an unusual vegetable that looks interesting to them — preferably one that they haven’t had before — and talk with the grower about it. See if you can get a raw sample of it and discuss how you can prepare it for them. Search for recipes on the internet for that vegetable and see which one sounds best to the child. If they see the process from start to finish (that is, raw right from the ground to cooked and on their plates), they might form a deeper appreciation for vegetables. Two of the most kid-hated vegetables, kale and Brussels sprouts, are as bitter as they can be if you eat them raw. However, if you want to make them into the sweetest nutritious treats a kid can eat, then brown sugar is your secret weapon. You can bake Brussels sprouts with a sprinkle of brown sugar and a drizzle of balsamic vinegar for a sweet and tangy flavor that might appeal to some children. You can cook a batch of kale with some brown sugar, olive oil, almonds, chicken broth, and cranberries. The key? Have them watch you put the sugar on them as you cook. If the kids associate these vegetables with a sweet flavor instead of bitter, they’ll probably ask for seconds. Amy Sowder of Chowhoun.com says roasting vegetables, whether on the grill or broiled in the oven, mellows the bitterness. All of their natural sugars are carmelized and come through. Plus, there’s that great smoky, toasty taste! If the vegetables are long or round enough, like carrots, quash, tomatoes, or even corn, you can place them directly on the grill or on a sheet pain under a broiler. For smaller vegetables like Brussels sprouts, it’s best to chop them up and wrap them in foil pouches — and don’t forget the brown sugar! If we want our kids to love vegetables, remember that “bitter is bad.” The less bitter we prepare our veggies to present to our children, the more likely they will probably eat them.